Kleintheater De vier Pelikanen (Small Theater Four Pelicans) is the smallest Art Nouveau theater in Europe, located in Leeuwarden. The building was designed by A.J. Kropholler and J.F. Steel and served as a branch of the insurance company “Utrecht”. 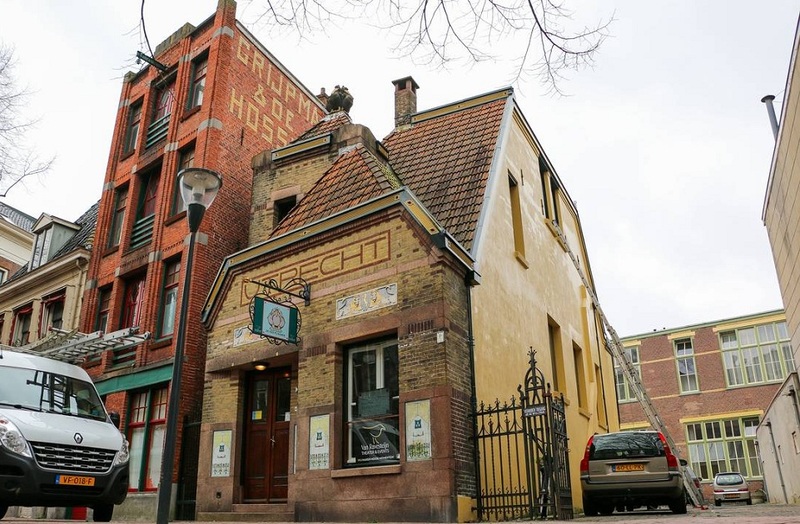 It was built in 1904 as insurance office. This building has been used as a theater since September 2013. The theater is run by volunteers and trainees. They receive no reward. The board not receive a reward for their duties as board members. Ravesteijn Entertainment is main sponsor of the small theater and is responsible for daily maintenance. This company partly bear the cost of rent and manages the catering license and serves drinks during the break. The theater was built largely from yellow brick with granite beams and blocks. The building consists of three parts: an advantage with a pitched roof, a rear portion with a pitched roof and a tower with pointed roof. On the tower there is a statue of J. Mendes da Costa, which depicts four pelicans. It is magical monumental inside and outside. It is a stunning building, with colorful stained-glass windows and a mosaic floor at the entrance. The beautiful stained-glass and the original brass chandeliers create a special atmosphere. The pelican is the symbol of the insurance sector. This animal, if necessary feed her brood with its own blood. In this theater artists interact with the audience because of the small size of the building. In this breathtaking building you can enjoy small concerts, theater dinners, cabaret, children’s theater, lectures, exhibitions and workshops. 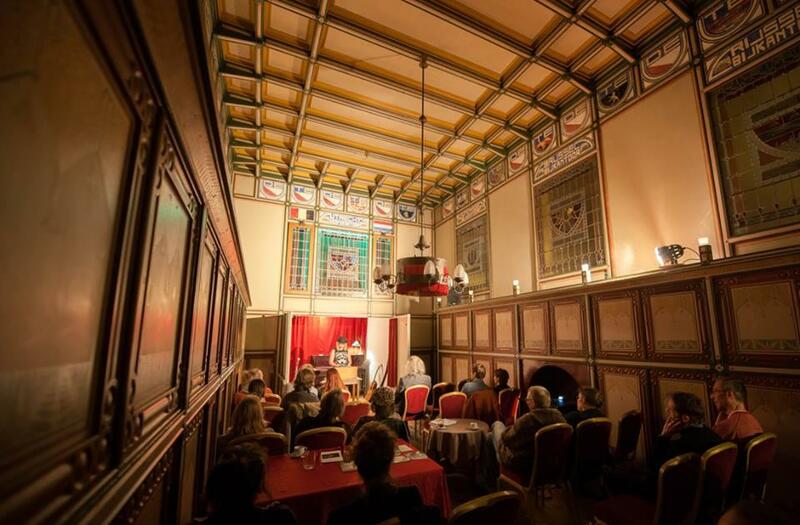 The hall is also available to be rent for meetings, presentations, weddings and parties. Theater also provide nice dinners, theater dinners, lunches and high teas. You have the opportunity to eat and drink with your company in one of the most beautiful halls in Europe. Inspiration is the key word of the four Pelicans. There theater can accommodate up to 35 people. The program is updated every month and is not fixed for a whole year. You are welcome to visit this theater during office hours. 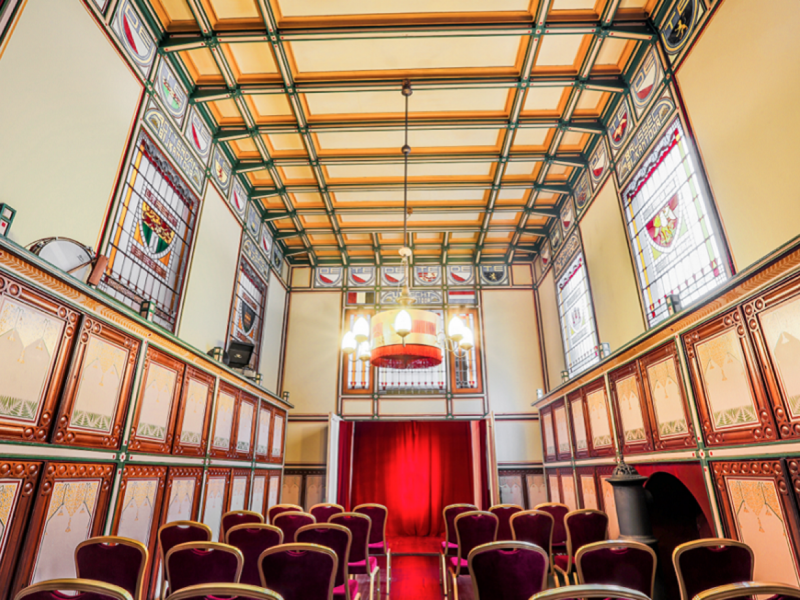 This theater is also a great place for a wedding ceremony.Guests will be overwhelmed by the atmosphere and intimacy that make it a perfect venue for a wedding.The theater is easily accessible and is located in the center of Leeuwarden. Free WiFi is available in the theater. There are traditional chalk boards to illustrate presentations. Sound amplification, flip charts and projector are also available for rent. @silvanafancel @VanRavesteijn Thanx. Heb er inmiddels 1! Maar erg leuk dat je reageert. @Seishonagon3 Vraagprijs ver boven taxatie. Hypotheek onmogelijk. Te klein voor rendement crowdf. Eigenaar wil het niet verkopen aan HdK. @PodiumTVnl @GraphicMindsbv @LaunchCafe050 Dank voor de gastvrijheid. Reserveren voor de speciale editie van de literaire avond kan nog op http://t.co/Y9hzcaYjoc Zaterdag 4 april om 20.00 uur. Saturday 4 april @DevierPelikanen: Ode aan @Planeetarjan & @marritjellema! Tickets at http://t.co/0oyBxJCYh6. Be quick, only 30 seats!!!! Op 11 april staat Inez Timmer in het theater met een muzikale lezing over het fabelachtige levensverhaal van 'Lili Marleen'. Ode aan de Levenden is verplaatst naar zaterdag 4 april. Een speciale editie met in de spotlights Arjan Hut & Marrit Jellema. Na Hubert & Betty is het zondag a.s. tijd voor klassieke zang in het theater. 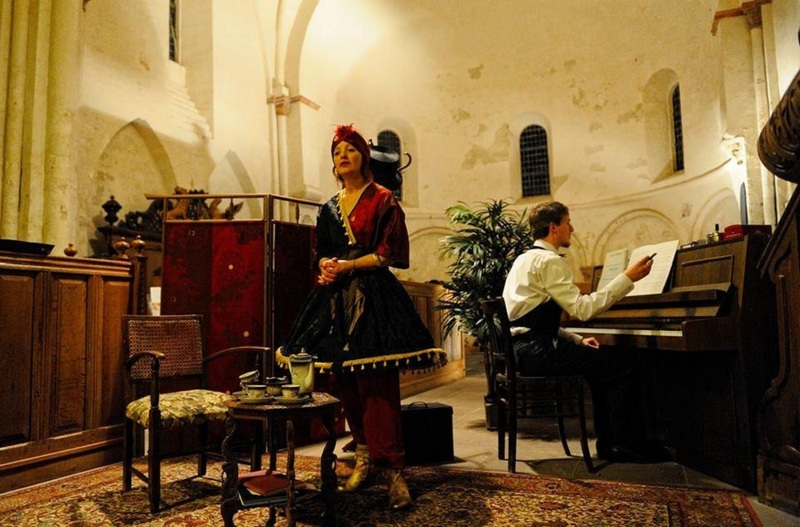 Madame Croche liederen debussy begint om 15.00 uur! U kunt nog reserveren voor een luxe lunch in de tijd van La Belle Epoque vanmiddag om 12.00 uur voor € 15,- p.p. Vrijdag 27 februari om 12:00 uur kunt u nog aanschuiven bij een luxe lunch in de periode van La Belle Epoque. €15 p.p Een lunch met verhaal. Voor het eerst in het Kleintheater: klassieke zang! Op 8 maart staat Gea Passies met "Madame Croche" liederen debussy op het podium! De literaire avond kan wegens omstandigheden helaas niet doorgaan vanavond. De volgende speciale editie staat op de planning op 11 maart!